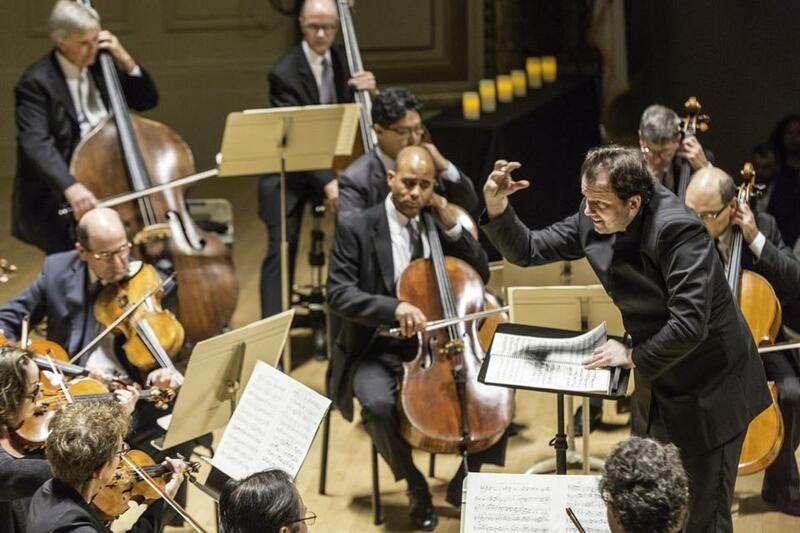 Andris Nelsons leads members of the BSO at Symphony Hall Monday. Since its founding in 1991 under the direction of Mark Ludwig, the Terezin Music Foundation has worked tirelessly to ensure that the music of composers who perished in the Holocaust does not vanish. At the same time, the foundation has placed alongside its goal of preservation a complementary mission: to carry forward these composers’ creative legacy by commissioning new works. In a way, then, it was organic for Ludwig, who is a violist in the Boston Symphony Orchestra, to expand the foundation’s commissioning work beyond the musical domain. To honor the current 70th anniversary of the war’s end and the liberation of the Nazi camps, he approached poets, hoping to solicit new writing on the theme of liberation. Ludwig’s ambitions were modest at first, as he told an audience gathered for the annual TMF gala concert Monday night in Symphony Hall. He aimed to enlist perhaps 18 poets. It turns out, however, there was a lot more to say. A total of 63 poets contributed to this project, hailing from 27 countries. The resulting collection, titled “Liberation,” was published this week by Beacon Press. It is one of the foundation’s signal achievements, a gathering of disparate variations on the central theme of freedom, refracted through the prism of the 20th-century past. For its Monday night event, the foundation went one step further and commissioned three new a cappella choral settings of the poems, and the singers of the Boston Children’s Chorus (led by Anthony Trecek-King) and Coro Allegro (led by David Hodgkins) were on hand to deftly present the works. Among them were composer David Post’s shapely, bright-hued setting of Cuban poet Ernesto Santana’s “The Day of Light”; Sivan Eldar’s vividly imagined “The Song About the Child,” with texts by Salman Masalha and Agi Mishol; and Pablo Ortiz’s elegant and richly layered setting of Richard Blanco’s “Leaving Limerick in the Rain,” which was also recited separately by the poet himself, speaking from the stage without music. The night began with a candle-lighting ceremony led by a group of camp survivors, participating alongside veterans who had been involved in the liberation of Dachau and Buchenwald. Poignantly, the latter group was meant to include a veteran named Susumu Ito, who served in the US Army’s storied 442d regiment. But Ito, a professor emeritus at Harvard Medical School, died last week at his home in Wellesley. He was 96. Born the same year as Ito was Gideon Klein, a gifted young Czech-Jewish composer interned at Terezin, where he became a major force in the show camp’s cultural life. Monday’s program concluded with a powerfully resonant performance of Klein’s Partita for Chamber Orchestra, played by members of the BSO under the direction of Andris Nelsons. The Partita was an arrangement (by Milan Slavicky) of Klein’s final work, a String Trio written in Terezin in 1944, not long before the composer was transported to Auschwitz. It is full of vibrant, motoric music steeped in Janacekian flavors, but already displaying a clear individual voice that hints at the quality of all the music left unwritten. Klein perished the following year at age 25. Works like the Partita require no special pleading, but even so, the music does not play itself. What’s more, as the living memory of the war continues to recede, the importance of its inscription in the art of this era will only grow. This foundation’s mission, in short, becomes more vital by the year. Correction: In an earlier version of this story, the instrument Mark Ludwig plays in the Boston Symphony Orchestra was misidentified.